This article [in the last issue – Friendship Shelter holds panel discussion, by Lynette Brasfield] and discussion should be on the front page of every major newspaper in the country. The major media does not cover this – and wonders why there continues to be violence and homelessness is rampant. The answer is plain and simple – mental health issues have been treated like something outside of “health”. As said – we do not wait for cancer to be stage 4 before treating it. Why hasn’t government treated this issue? Last week I was working on a local whale watch vessel and noticed a shiny, colorful object floating on the ocean. An exotic marine creature? Not. It was a Mylar foil balloon that had drifted from someone’s Mother’s Day celebration and made its way to the sea. And then I remembered last June, when the crew and I removed many “Congratulations, Graduate!” balloons from the water. Balloons are given to celebrate life events, yet for marine animals, balloons and other plastic trash may mean death. Yes, Mylar balloons are shiny and festive, but they often end up in the ocean, where sea turtles, whales and fish make the deadly error of ingesting them, having mistaken them for food. It is heartbreaking to see birds, dolphins and sea lions entangled by the balloons – string and all. And those that don’t directly injure ocean creatures eventually break down into micro plastics that will take hundreds of years to decompose. Even on land, floating Mylar balloons are a hazard, often coming into contact with power lines and causing power outages or fires. Did you know that California law requires that all Mylar balloons be weighted so they can’t take flight? Given the many hazards they pose, I’d like to put forth a challenge to my fellow coastal citizens: Omit Mylar and latex balloons from your graduations and other worthy celebrations this year – and every year. Imagine our new graduates and their families using sustainable decorations that protect our precious coastal waters. Imagine stores refusing to sell Mylar balloons. Imagine launching the next generation into a future that solves the plastics problem. This is my challenge. We can do this! Adults more stressed than students? Count me among many who admire PTA and SchoolPower leader Tammy Skenderian. Her public endorsement of a proposed LBUSD school calendar change invites a respectful dialogue on our town’s political values. With refreshing candor Skenderian discloses past opposition to a mid-August back-to-school schedule. Now, with students at LBHS, a return to classrooms in summer best meets her personal needs. Fine, except Skenderian admonishes parents who disagree to “put their personal agenda aside” for kids and community. Not her intent perhaps, but that logic suggests her personal agenda is civic minded but not so the personal agenda of opposing parents. Many parents would tell a counter narrative of “personal attacks” by politically immature school officials aimed at moms and dads daring to openly challenge school policy. Examples include a dozen parents in math professions publicly vilified for respectfully opposing trendy unproven math curriculum. Our elected school board used public school staff and funds to co-produce with SchoolPower social media ridiculing parents advocating for children. Targeted parents were graphically portrayed “losing their minds” and hiring a biker hitman to kill the school superintendent. That so-called “satire” was posted on LBUSD’s website and screened at SchoolPower’s gala. BTW turns out parents challenging math curriculum were right. LBHS underperformance in math compared to schools spending half per student is no laughing matter. The larger lesson is that school officials demeaning parents as irrational, “crazy” or selfishly opposed to greater good poisons our public school civic culture. The chilling effect on robust public debate breeds toxic social intolerance we all channel at times, until too many well-meaning parents feel not only stressed, but ambushed and “personally attacked” for speaking up. It’s not just supporters or opponents of school calendar change or any single issue who define civic culture. We all need to work on listening more before we speak, disagree when it matters, and do so respectfully. High performing school boards promote real diversity by creating a strong public record on the merits with full and fair participation, and then stand by decisions without taking sides in divisive public or private civic shaming. Last week was the first anniversary of special counsel Robert Mueller’s historic investigation. President Trump claims it is the biggest witch-hunt in American history. I say it is American justice at its finest. I clearly understand why the president wants to bury what he believes is more than a pebble in his shoe. As of now, the Mueller team has indicted 19 individuals and three business entities. Heading into its second year, there is no sense the investigation is anywhere near finished and, frankly, that is as it should be. I like the fact the special counsel continues to quietly go about his business despite all the public distractions Mr. Trump and his advisors throw at him daily. In the end, no matter when that occurs, I have faith the American people will be well served. Too bad the President of the United States does not believe that. In a time when small district congressional elections are making news on the national scene, we here in the 48thdistrict (which encompasses Laguna Beach, Newport Beach, Costa Mesa and Huntington Beach as well as a small part of Laguna Niguel) had better pay attention to what’s going on in our own backyard. In this “jungle primary,” which has 16 candidates listed on the ballot for United States Representative 48th District, only the two top vote getters will proceed to the November election. But did you know that three of the names listed on the ballot have withdrawn from the race? That’s right. For example, if you had planned to vote for a female Democrat, the two women who fit this description on the ballot have since withdrawn from the race, so think again. Ballots are confusing enough with so many seemingly obscure roles to fill. But this congressional seat is major. If we elect the right person for this office, great strides can be made. While the candidates’ websites can be helpful, offering information regarding key issues and endorsements (as well as indicating their level of sophistication and engagement), personal recommendation from friends, neighbors, local business leaders and grassroots organizations can speak volumes. I don’t know about most of you, but I do not trust the California Democratic Party endorsement for this position – I’ve read that the guy they picked wined and dined each and every one of the delegates, however he did not win a single debate. We all need to take an interest in this. Our future, and our children’s future hinges on it. The current political climate is a disaster exacerbated by Trump’s ineptitude and his dismantling of many key programs that benefit all individuals, our state, our country and our planet. We absolutely need, each and every one of us, to take an active role and unite behind one good candidate. I believe that candidate is Harley Rouda. Harley Rouda jumped in early – he declared his candidacy shortly after Trump was elected, compelled to put himself in the ring as a positive and active driver for better outcomes in our nation. That means clean energy, equal rights for all, an end to gun violence, fair immigration policies, healthcare for all and more. Harley is articulate, committed, and engaged. He is a well-educated people person who has already made frequent trips to Washington and is cultivating relationships so that when he arrives, he’ll spring right into action. Harley is the one who can really win it in November and also do a great job once in office. Don’t wait until you’re in the voting booth to decide. This decision is too important. Make your decision now. Vote Harley Rouda. Harley Rouda for United States Representative, 48th District. As an avid seamstress during the seventies and eighties, she made custom bikinis under the Perfect Casuals label. She also worked at El Morro Elementary School in Laguna Beach from 1988-1996 and Our Lady of Fatima in San Clemente from 1996-2001. She played a major role developing the Laguna Beach Unified School District Disaster Preparedness Program following the 1993 fires. After retiring from the school districts she returned to her creative passion and started making children’s products under the Pineapple Kid label. These products were retailed at the Laguna Beach Sawdust Festival, which was a fulfilling time in her life. Penny was a creative, kind soul and she loved working with children. Her greatest joy in life was family and she was always present. The Steris family home was open to all and she was a second mother to many generations of kids. Undoubtedly she dedicated her entire adult life to her children and was a caring and loving mother. Whether it was coaching little league for her son or LBHS softball for her daughter, she was hands-on and very active. One of her favorite times of the year was during the Brooks St. Contest. She was a pillar volunteer for morning sign-ups and loved watching the kid’s rip, a Surf Mom at heart who loved the ocean and warm sunshine. The motto she valued and lived by was “Live by the Sun and love by the Moon”. Her physical presence will be greatly missed but Penny’s Aloha spirit will always be with us. She is survived by her Husband of 50 years, Daryl Steris, children Jason and Malena, and grandchildren, Ava, Ollie, Colter and Cannon. A Hui Ho Penny (until we meet again). A memorial followed by a paddle out to celebrate Penny’s life will be held Sunday, June 3 at 10 a.m. at Treasure Island Point in Laguna Beach. The month of June is officially LGBTQ Heritage & Culture Month in Laguna Beach, as proclaimed by Mayor Toni Iseman and City Council over a year ago. It is the time of year when our wonderful city celebrates and honors the rich contributions of the gay community to Laguna Beach. 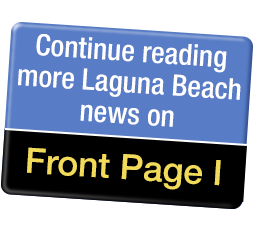 Part of this month-long celebration is Laguna Beach Pride, which takes place this year over the weekend of June 1 - 3. A true partnership between the City of Laguna Beach, Visit Laguna Beach, Laguna Beach Chamber of Commerce and the Laguna Beach LGBTQ Heritage & Culture Committee, Laguna Beach Pride welcomes both visitors and residents alike to participate in the annual festivities, from dancing the night away at Main Street Bar & Cabaret and the legendary Boom Boom Room to Aloha Drag Bingo Brunch at Royal Hawaiian to soaking up the sun at the West Street Beach Party. It is important to say that Pride is more than just a party. Pride creates a sense of belonging for people who may not feel it. Pride opens its arms to everyone who finds it comforting, uplifting and empowering. Pride gives hope to those who feel that life may never get better. Pride provides the freedom to be who you are. Pride is about the possibility of love. Everyone is invited. The West Street Beach Party is open to all ages and families. The Pride Pavilion at Mountain Street is also open to everyone, although guests under 14 must be accompanied by an adult. Laguna Beach Pride strives to ensure that our young LGBTQ residents and visitors also have the experience of finding themselves reflected and honored in our community. The Laguna Beach Chamber of Commerce encourages our local business community to participate as well. Showing your Pride is simply good for business. Ways to participate include optimizing your merchandising and window displays, running an ad or promotion such as a specialty cocktail or hotel room package, becoming a Laguna Beach Pride advertising sponsor, flying a rainbow flag and hanging the official Laguna Beach Pride poster in your window. As previously stated by Toni Iseman: Laguna Beach does not merely tolerate the gay community. Laguna Beach embraces the gay community. Local issues like traffic, crowded beaches, parking and parties at summer rentals often are the focus of resident complaints as summer gets under way. But another issue lurks behind the scenes year-round: resident readiness for emergencies. Some of us ignore the issue; some might fall into the ‘doomsday-prepper’ category. But there’s no question that every single resident of this city should make sure they are ready to hit the road if a fire, earthquake, landslide, high tide flooding, gas leak or other emergency occurs in Laguna Beach. This October 27 will be the 25th anniversary of the devastating 1993 fire that destroyed hundreds of homes and briefly threatened downtown and beyond. Those who lived here in 1993 will never forget – and many of us have had go-bags and family emergency plans ever since. But there are always procrastinators who never quite get to that item on their to-do lists. And newer residents may be unaware of what happened a generation ago, much less the dangers we face in a coastal town with just two roads in and out. With that in mind, Laguna Beach CERT (coordinating through the Emergency Operations Coordinator/Police Department) launched a “Prepare Laguna Beach” effort last month to raise awareness by asking residents to sign a pledge to be more prepared for emergencies. The City Council also supported the effort and it was officially launched May 1. The goal is to be the Most Prepared City in Orange County. And it only takes about a minute to pledge online at www.lagunabeachcity.net/getprepared. Your pledge to be more prepared will be counted only for the purpose of counting the total number of signers. Our goal is to get 2,800 households to ‘sign the pledge’. We hope you will embrace this effort so that we can be the Most Prepared City in Orange County with residents in every age group ready to ‘get outta Dodge’ when the situation arises. There is no political agenda – just a big motivation to make sure our residents know how to stay safe and know when it’s time to go. Please be among them. You’ll find CERT members at ‘pop-up’ booths around town throughout the summer who will help you sign up on the spot, give you a preparedness item for your kit and send you off with thanks and good wishes! Since we started this campaign together almost a year and a half ago, we have accomplished so much. From the tremendous grassroots support we have had since the beginning, our campaign has received endorsements from every facet of the Democratic Party – from local elected officials such as Toni Iseman, Katrina Foley, and Gina Clayton-Tarvin, to national leaders such as the entire Democratic Congressional Delegation from Orange County as well as many other members of Congress; from environmental organizations such as the Sierra Club to progressive organizations such as the California Nurses Association and the Progressive Democrats of America; from organizations fighting gun violence like Moms Demand Action and Pride Fund Against Gun Violence to LGBTQ organizations like Equality California. And most recently the DCCC has put us on Red to Blue – just one of three campaigns in all of California. It’s our time to move Orange County forward. I’ll fight for common sense change in Washington. Together we are the only campaign that can beat Dana Rohrabacher. I hope I can earn your vote on June 5th and together we will Flip the 48th. Important tone for the present controversy – here’s a “granny flat” poem by Marcy Wingard – see below. in memory ‘til mine have fled.